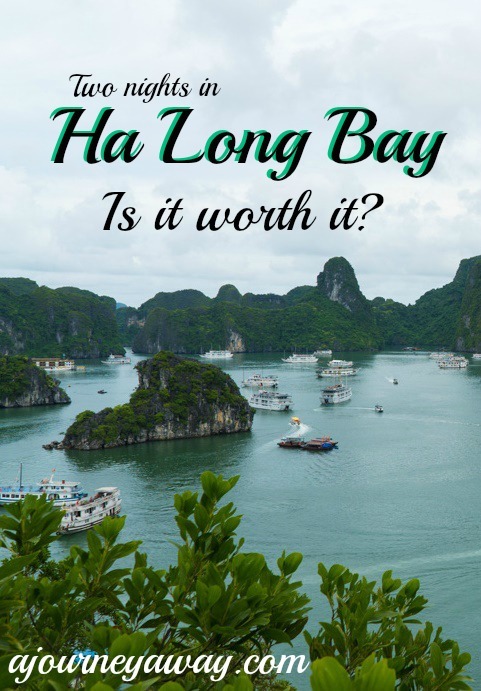 Two Nights In Ha Long Bay, Is It Worth It? 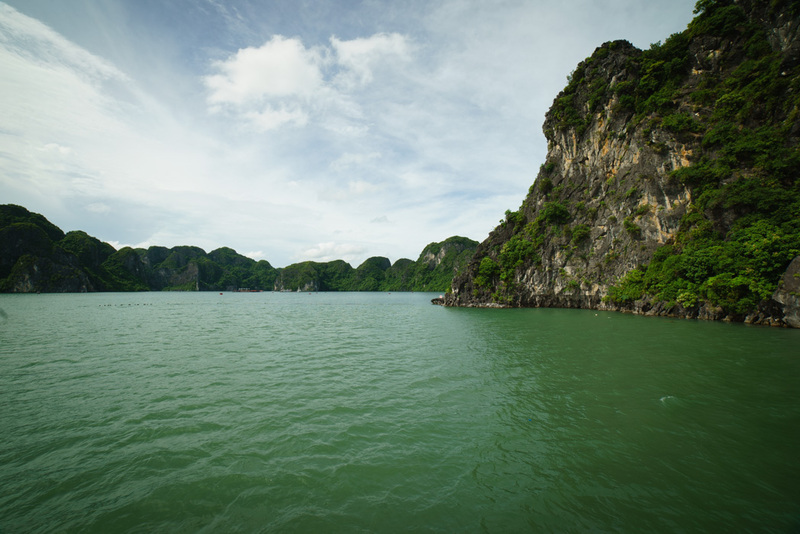 Taking a cruise in Ha Long Bay is definitely one of the main reasons for people to go to Vietnam and we were no exception. As soon as we decided to visit the country, we knew we would go see this wonderful place. 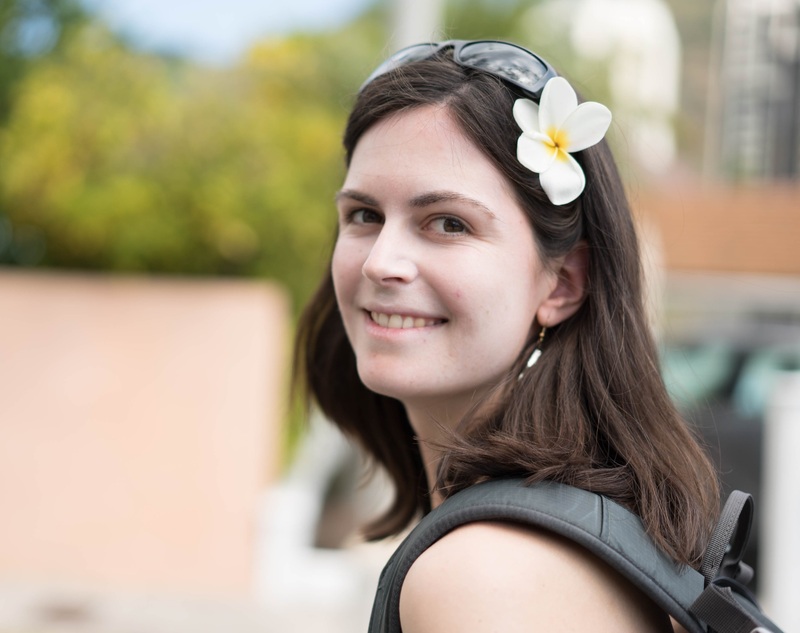 Even if it is highly touristic, I wouldn’t recommend skipping it. I don’t think that there is anywhere else in the world where you would have the same experience, with or without the crowd. Going there during the low season (we went early July), we were actually not bothered by the amount of tourists, although we were surprised by the number of boats in the bay and we wondered what it must be like during the high season. Talking about low season, or rain season, don’t necessarily let it stop you if you can’t choose other dates. You might be lucky like we were. The weather forecast really wasn’t on our side for the three days we were in the bay but we didn’t see a single rain drop until the boat was cruising back to the harbour on the last day (and it was only light rain). 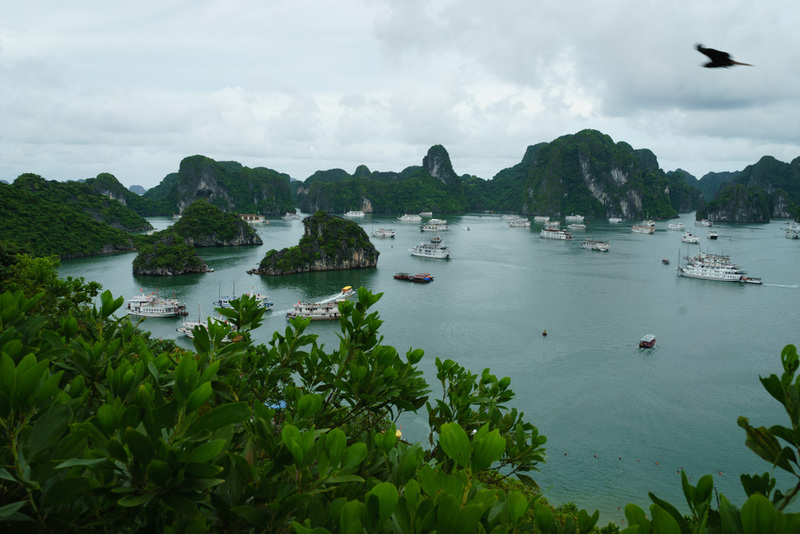 While a lot of people who visit Vietnam go to Ha Long Bay, most only stay for one night. When my dad visited my brother (who lives in Ho Chi Minh City) one year ago, that’s what they did and they both came back with the conclusion that an extra night wouldn’t have been too much. So we quickly decided that we would stay two nights. Choosing a cruise can be a tedious task since the numerous companies basically offer the same activities and the same range of services, with more or less luxury. We had heard a lot of unflattering accounts about the budget cruises, from rats on the boat, to sketchy bathrooms and all night partying. That was everything we wanted to stay away from to make the most of our trip even if it meant spending a little bit more money. We eventually picked the Phoenix Cruise offered by the Blue Dragon company for around 400 dollars for two nights and we do recommend them. We were picked up at our hotel in Hanoi and met our guide, Thanh (or Tony, if you can’t pronounce it right – the wrong intonation and we were saying one of the other six similar words of the language). He told us some stories about the city and other areas we were driving through. Tony asked if any of us had particular diets so that he could inform the chef of the boat. Guess who were the only two people to raise their hands…. yes, us! The drive took almost four hours and once we were at the harbour, we were already able to enjoy a nice view. The number of companies and cruise boats was impressive and we were happy to discover ours. The ship was very clean and our room, nicely decorated and fitted with hot water and AC. I especially loved the sundeck where we could already see ourselves relax and sunbathe with a drink. Lunch was served as we were cruising to the bay. The view was wonderful and I can say the same about the food. Dishes never stopped arriving, one after the other. 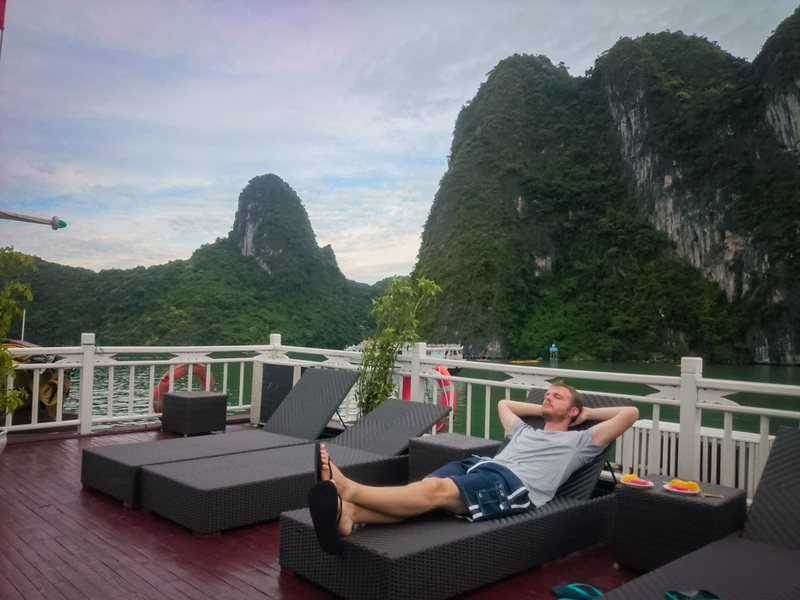 After some time to relax on the sundeck and to enjoy the incredible view, we went kayaking, which must be one of the best ways to make the most of the scenery. 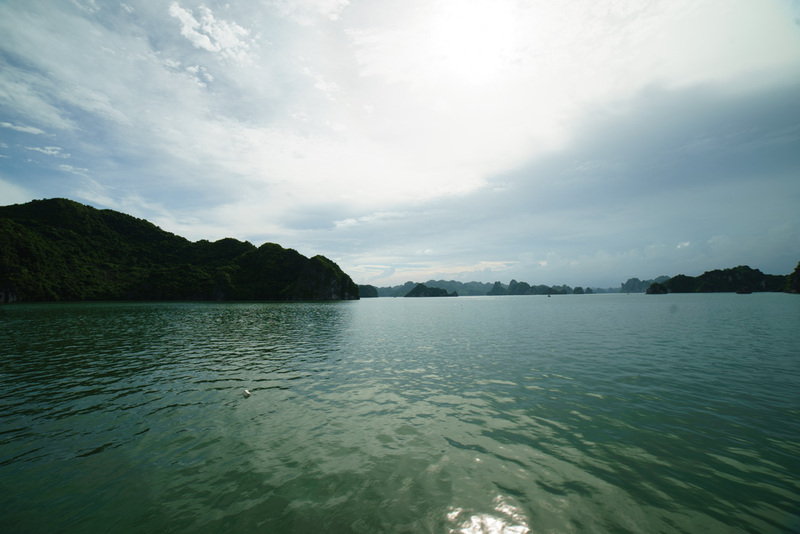 We went through caves and around several islets before going back to the boat and being taken to Ti Top island. Don’t expect too much from it. It’s not the nicest island to put it lightly. The whole place and especially the beach was extremely crowded. It was like the dream had stopped for a while. We skipped the beach and climbed up the stairs to enjoy the view. After this forgettable stop (just stay on the boat, you won’t miss out on anything…), some fresh fruits, tea and coffee were waiting for us on the sundeck of our boat and we were able to rest again before dinner. Our evening meal was very hearty again and we wondered what they would do with the leftovers, as guilty as we felt to leave the plates half full. This is the extra day we had in the bay. We were actually the only people in our group to be on a two-night cruise so right after breakfast, we were sent to another boat where we met the two other couples we were going to spend the day with, still accompanied by our awesome guide Tony. The boat cruised for several hours to a much quieter part of the bay where we didn’t see any other tourist boats. To me, that was enough to justify an extra night in the bay. We then went for another kayaking ride and stopped in a cave where some locals were cooking lunch. I’m sure they could have found a better place considering how dirty it was though…. 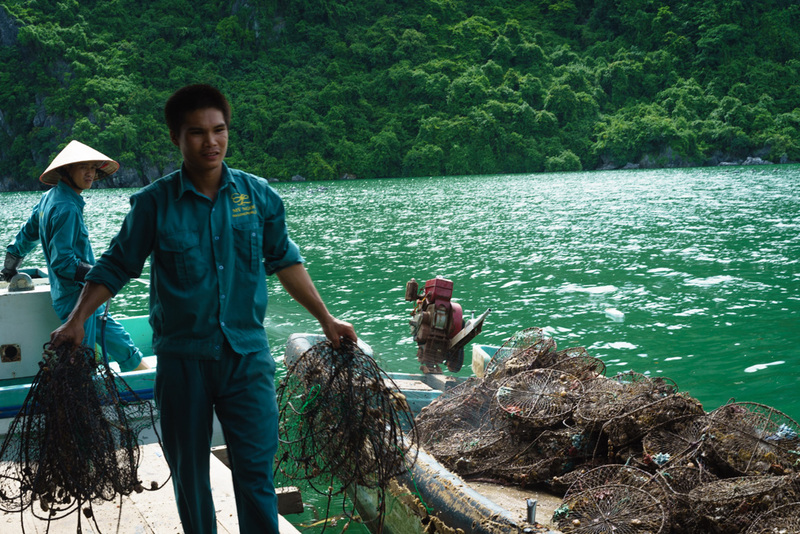 We were told that the bay is overall cleaner than a few years ago, but let’s say there’s still some work to be done. After another giant lunch on board, we got to visit a pearl farm. We were then brought back to our respective boats and even had ours to ourselves before the new group on a one-night cruise came back from Ti Top island. We both loved this very quiet and relaxing day. 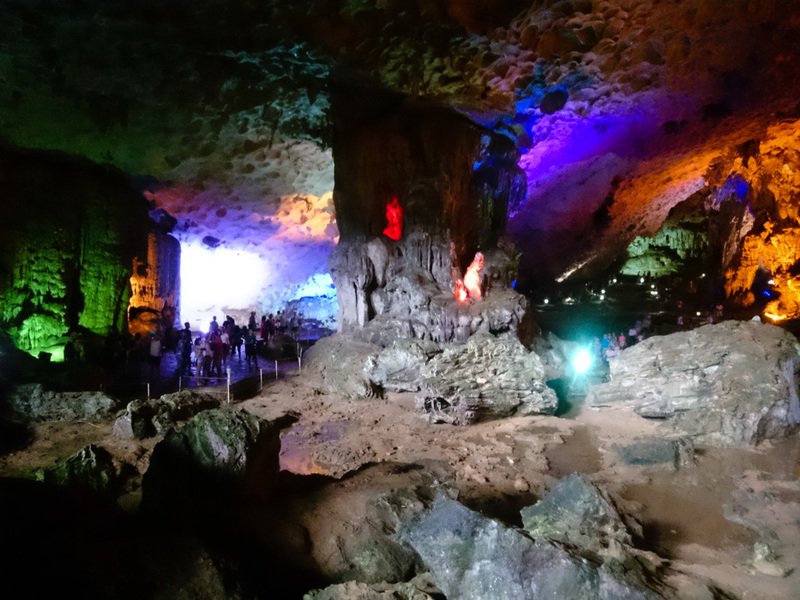 The visit of the biggest cave of the bay (the Surprising cave) and a cooking demonstration on board were on the program of that last day. One more surprise was waiting for us before the end of the cruise. Tony came to talk to us. 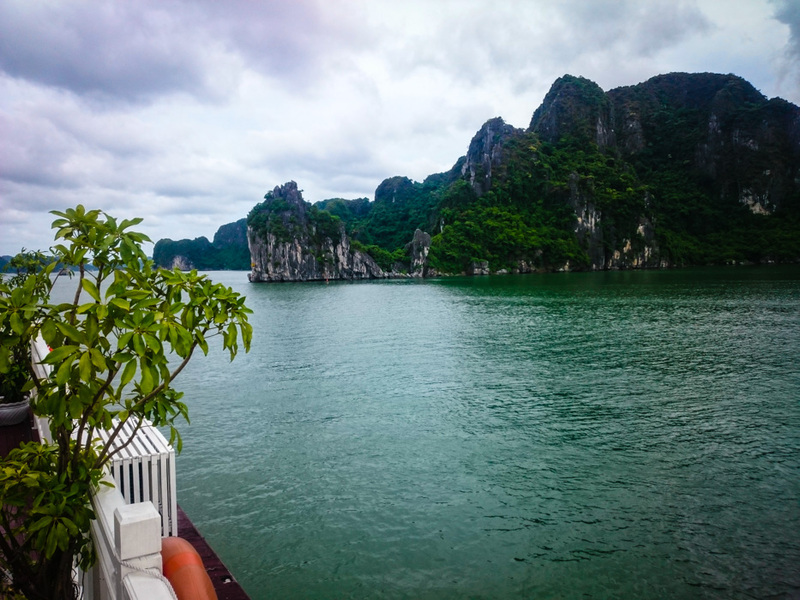 He explained how he was trying to become a food tour guide in addition to his job on Ha Long Bay, but that his boss wouldn’t let him work until he took a one-month training. Tony came up with a suggestion for us. He would give us a free street food tour in Hanoi in the evening (which was our last night in Vietnam) and we would leave a good, and honest of course, review for his boss to read. It sounded like an awesome plan to us and an opportunity not to miss. But this is a story for another day. 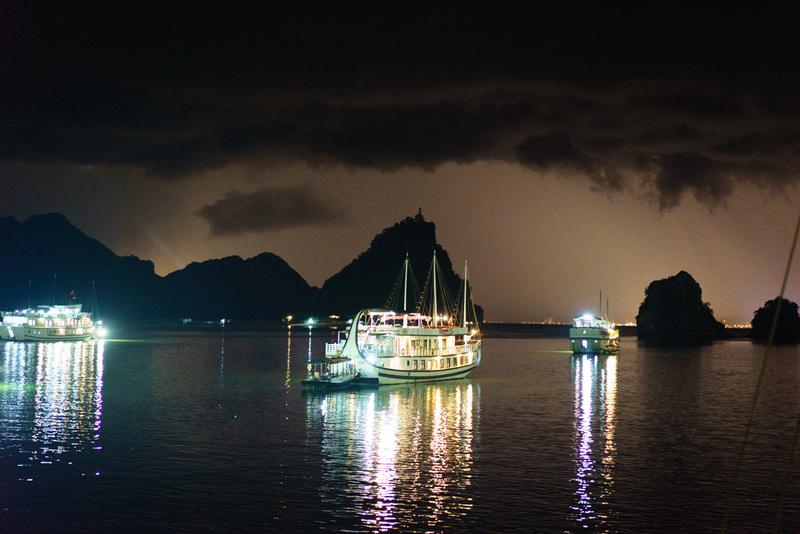 If you’re still not sure how long to stay in Ha Long Bay, I would say an extra night is definitely worth it. You don’t do that much more than on a one-night stay but seeing a part of the bay without any other tourists was a great plus. It didn’t feel rushed and if you’re like me and can never have enough of a beautiful landscape, you won’t regret it.